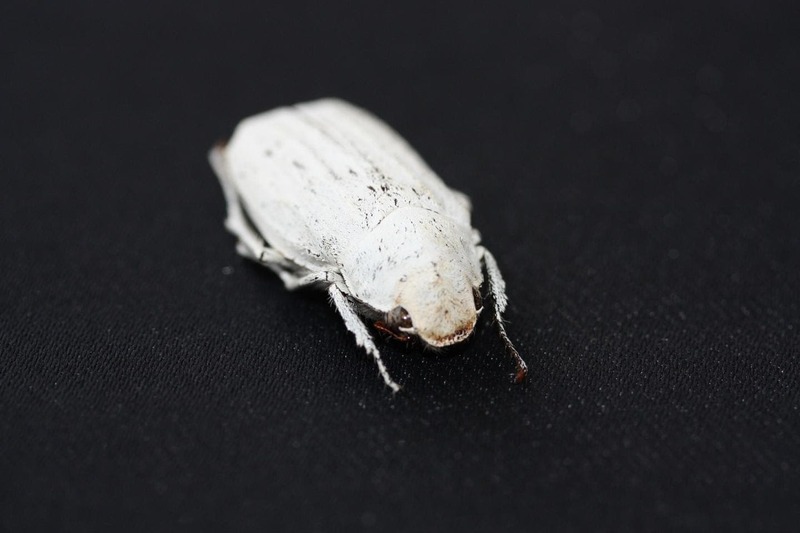 With the help of a Southeast Asian beetle, British and Finnish researchers have devised an ultra-white coating that could be used to make some of the brightest paints and coatings. The coating is super-thin, non-toxic, and edible, which could make it appealing for everything from the cosmetic to the food industry. A Cyphochilus beetle, which inspired the super-white coating. Credit: Olimpia Onelli. The Cyphochilus beetle has unusually bright white scales that cover the whole exoskeleton. They’re actually whiter than paper or any artificial material produced thus far. In 2014, researchers at the University of Cambridge learned that the insect’s super-whiteness has something to do with the complex molecular geometry of its scales. Despite being incredibly thin, the scales deflect all colors with equal strength and incredible efficiency — something which is very rarely found in nature. Now, the same team has found a way to mimic the Cyphochilus‘s scales into a coating. The idea was born out of a presentation about cellulose membranes for gas filtration at a conference. “Could we use the same process to fabricate an ultra-white material? This is how this fruitful collaboration started,” Dr. Olimpia Onelli, a researcher at Cambridge’s Department of Chemistry and co-author of the new paper, told ZME Science. Unlike other commercially available white products, which incorporate highly refractive particles (titanium oxide or zinc oxide), the new super-white coating doesn’t rely on pigments to reflect light, but rather chitin — a fibrous substance consisting of polysaccharides, which is the major constituent in the exoskeleton of arthropods, the cell walls of fungi, and the shells of molluscs. Chitin naturally scatters light extremely efficiently thanks to its structure. Some butterflies sport spectacular coloring thanks to the nanostructures present on the surface of their wings, which have a specific pattern. However, to produce white, you want the structure to be hit by light as randomly as possible. “After a few months of testing the membranes, however, we encountered a problem. We were measuring the percentage of light transmitted through the membranes as a function of the membrane’s thickness: usually, the thicker the membrane, the less light passes through and the relationship between these two quantities is linear,” Onelli said. “However, something was different here and this is when we had a real ‘aha!’ moment: light was not propagating normally in the membranes; in fact, the propagation was anomalous due to the anisotropic nature of the material which improves the whiteness of the membranes,” she added. Cyphochilus beetle and cellulose coating. Credit: Olimpia Onelli. Starting from tiny strands of cellulose (nanofibrils), the Cambridge researchers, in collaborations with colleagues at Aalto University in Finland, were able to mimic the structure of chitin. By varying the diameter of the nanofibrils, which look a lot like spaghetti, the researchers effectively tuned the opacity of their material, and hence its whiteness. They eventually hit a sweet spot, finding just the right combination of nanofibrils. Each membrane is no thicker than a few millionths of a meter. The resulting coating is 20 times whiter than paper, and since it’s made from cellulose, it is non-toxic. The Cambridge researchers say that the ultra-thin membranes could be incorporated in the next-generation of bright, sustainable, and biocompatible white materials. “We think that bio-inspiration can provide us with a route towards sustainable materials: not only in terms of the materials used but also in terms of fabrication routes. We are studying nanomaterials self-assemble in nature to learn about bottom-up fabrication techniques which can replace the more expensive and less environmentally-friendly top-down approaches which are currently used,” Onelli said. This is just the latest in a string of scientific papers that took cues from nature. Elsewhere, researchers at Harvard University combined the water-collecting traits from the awesome Namib desert beetle with those of the cactus and pitcher plants to devise a material that seemingly makes water out of thin air. And General Electric chemists turned nanostructures on the butterfly’s wings into an infrared (IR) detector. These are just a few examples. “There are a lot of tricks that we can learn from nature to make, for example, hydrophobic surfaces inspired by the lotus leaves or super-adhesive membranes inspired by the feet of geckos,” Onelli told me. Next, Onelli and colleagues want to further improve the performance of their membranes by fine-tuning the size and spatial arrangement of the cellulose nanofibrils in order to enhance the whiteness. “We would also like to work on on the surface chemistry of the fibrils in order to strengthen even further the material so we can expand the range of applications,” she said. Scientific reference: Matti S. Toivonen et al. ‘Anomalous-Diffusion-Assisted Brightness in White Cellulose Nanofibril Membranes.’ Advanced Materials (2018). DOI: 10.1002/adma.201704050.